There is a lot I could say about yesterday’s fall economic update—like how small, relatively speaking, the government’s commitments are for infrastructure—but it can wait for another day. Here I’ll just focus on the new Canada Infrastructure Bank the government is setting up to co-ordinate and disburse new money. One of the key justifications for the infrastructure bank is to reduce costs and increase access to loans for Canadian cities. Unfortunately, as the figure here shows, the bank’s lending structure will actually cost cities an extra $6.2 billion on the $20 billion promised for infrastructure. That’s because roughly a third of the benefit from the new money will be wasted on higher interest payments. Interest rates differ for different levels of government. Cities pay roughly 2.2% on a five-year bond right now. It’s less for the provinces; for example, B.C. is presently paying 1.5% for its five-year bonds. The federal government pays the least interest of all at a rate of 0.7%. The private sector, on the other hand, expects dramatically higher returns in order to build infrastructure. For example, the head of the Caisse de dép?t pension plan, Michael Sabia, who sits on Finance Minister Morneau’s Economic Advisory Council, expects a 7% to 9% interest rate on his P3 projects. An infrastructure bank could, given the right mandate, lower the borrowing cost for cities from 2.2% to the 0.7% federal rate, saving them a lot of money in interest. Such a bank could also simplify the process of accessing bond markets, which would get projects off the ground sooner. But this is not what the federal government has done. Actually, the proposed federal infrastructure bank will likely make it more complicated for Canadian cities to seek and receive infrastructure funding and at higher cost. The total amount in the new bank would be $35 billion: $15 billion will come from the federal government and $20 billion from private lenders. While the government is treating this all as direct funding, the bank will actually be loaning money to cities that needs to be paid back eventually. Right off the bat this seems awfully cheap given how low federal interest rates are, and the fact federal funding for infrastructure is at all time lows compared to other levels of government. More worrying, though, is that the $20 billion in private sector money is just a fancy way of saying these infrastructure loans will be structured as public private partnerships (P3s). The fiscal update speaks misleadingly about “bringing in private capital to the table to multiply the level of investment.” In fact, whether the feds sell bonds or use P3s for infrastructure, the money comes from the same place: large institutional investors like pension plans. The difference is in how much money private investors will take home at the end of the day. Pension plans are among the largest purchasers of federal bonds (paying 0.7% interest) and also of P3s (paying 7% to 9% interest). Obviously, if they had a choice, pension plans would want to put more money into the latter. The Canada Infrastructure Bank obliges them. Why is this a big deal? For one thing, it will cost us (the public) a lot of money. Ontario has a fair amount of experience with P3s, much of it painfully detailed in a 2014 report by the province’s auditor general. It found that on the $26 billion worth in recent P3 projects, the province will end up paying $8 billion more than it needs to, mostly due to higher interest costs. If the federal experience with P3s looks anything like what happened in Ontario (and there’s not much reason it shouldn’t), we should expect the infrastructure bank’s $20-billion loan program to be unreasonably expensive in the end. 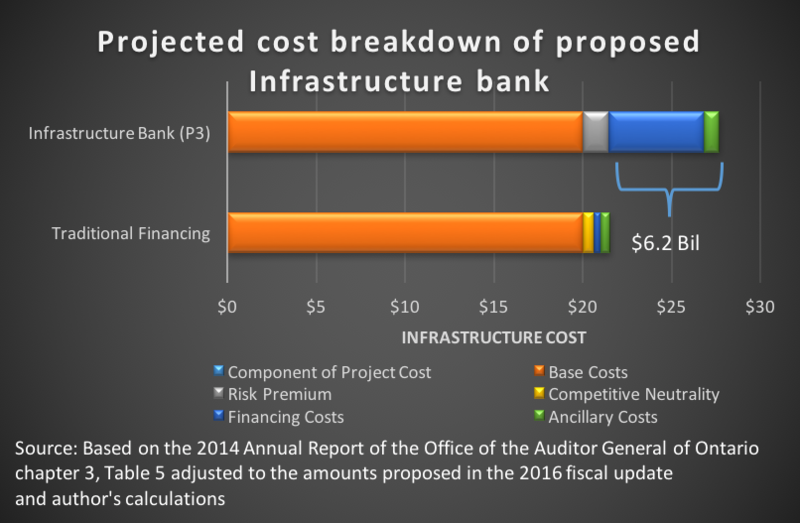 We can show this by adapting the Ontario P3 analysis to project a cost breakdown for the proposed federal infrastructure bank. In the projections both traditional financing and the P3 portion of the infrastructure bank start with the same $20 billion, as laid out in the fiscal update. The P3 approach will result in higher projected ancillary fees and risk premiums, but it primarily results in dramatically higher financing costs of $5.4 billion compared to the traditional financing costs of $400 million. In the aggregate, taking the P3 route on $20 billion of the infrastructure bank money will result in an additional projected cost of $6.2 billion for cities. In other words, roughly a third of the money will be wasted on higher interest costs over the life of the project. David Macdonald is a senior economist at the Canadian Centre for Policy Alternatives, and the coordinator?of the?Alternative Federal Budget. ?Follow him on Twitter?@DavidMacCdn. Canada already has an infrastructure bank that is fully owned by the people of Canada, the BANK OF CANADA. The bank was used to issue interest free loans from 1934 -1975. IF the Federal government were to re utilize the BOC, infrastructure cost would be lower because there would be no interest to pay and no debt to carry. The money created would be spent into existence at zero interest, not loaned into existence at interest forever. There is no need to introduce another bank that issues loans at interest. See the following links for more info. Well Red, parts of that are certainly true. Yes: the Bank of Canada does lend to the federal government at essentially 0% interest, although there is an upper limit as to how much it can borrow at 0%. No: that didn’t stop in 1975, it actually continues to this day. No: that wouldn’t mean there would be “no debt to carry” the debt would still be there. The upper limit is an arbitrary amount. And while it didn’t stop in the the 70s it seriously declined and is only recently climbing again. But if the BoC held the entire debt the interest the government paid on it would almost completely be returned to the government as revenue. That is currently $25.7 billion. But pension funds and other investors would have to find new place to park their money. Currently a much smaller part of what the government pays in interest — debt service charges — is returned to the government. The rest goes to those who are already well-off enough to be able to loan the government money. What do they do with it? Avoid taxes and park it in off-shore accounts? I did the Math too and from my reading of the FES the government will capitalize the bank with $35B, of which $15B will be spending and $20B will be loans. Then, the entire $35B will be leveraged with the private sector. This would create, based on a 1:4 leverage ratio of up to $175B in spending. I can send you our analysis if you like. Please email me at [email protected] Thanks!